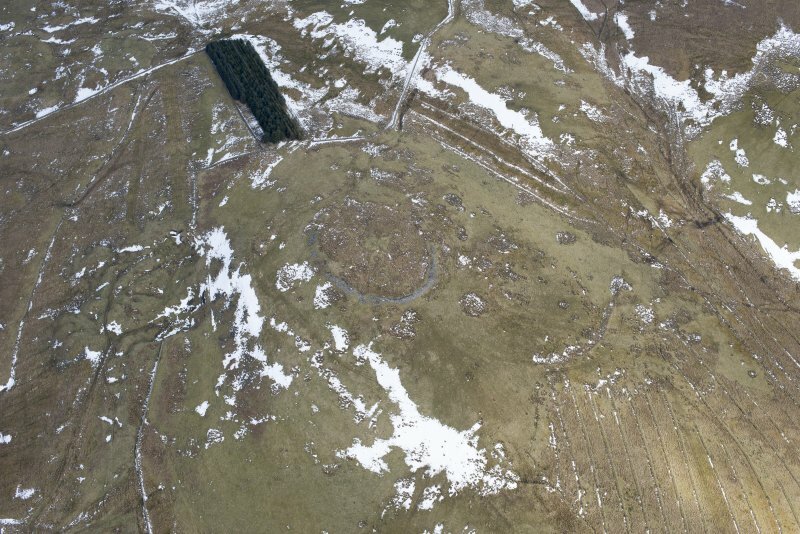 The fort (R W Feachem 1963; RCAHMS 1956, visited 1949) walled settlement (R W Feachem 1965) crowning the conspicuous summit of Carby Hill (875 ft OD) consists of an oval enclosure measuring 285 ft by 225 ft within the massive ruin of a stone wall which must originally have measured 10 ft or 12 ft in thickness. The inner edge of the tumble is followed by the ruin of a relatively recent dry-stone dyke. 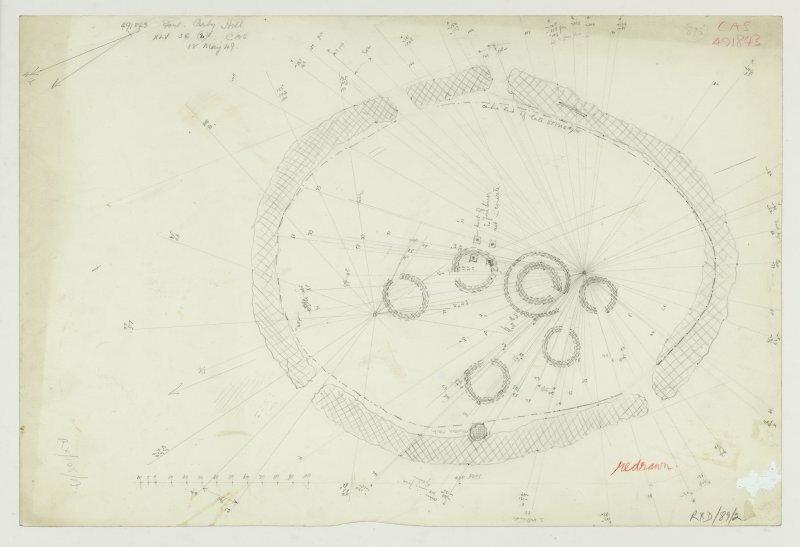 The interior contains at least six circular stone-walled hut foundations (twelve are noted by J Maughan 1868) probably of 2nd century AD or later date. 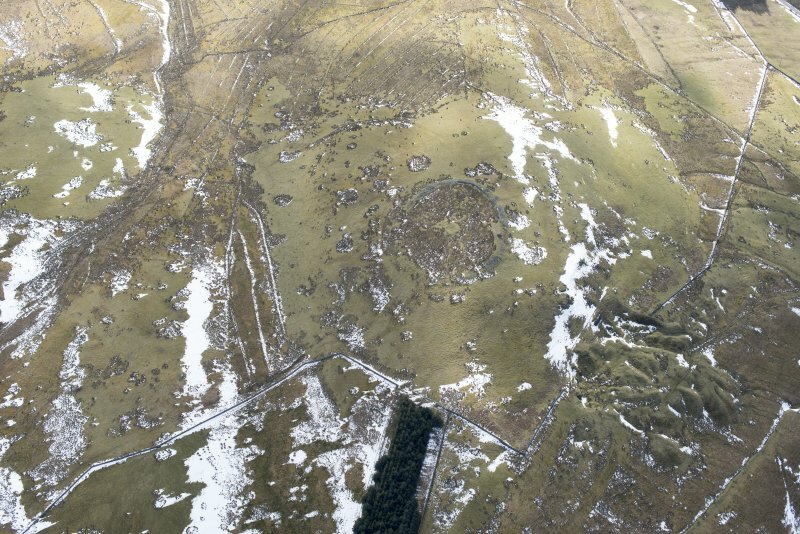 This fort might possibly represent an unusually large example of this kind of late settlement, but it is also possible that it originally contained timber-framed houses of which no surface traces now remain, and that it dates from pre-Roman times. This probable settlement has dimensions as stated. 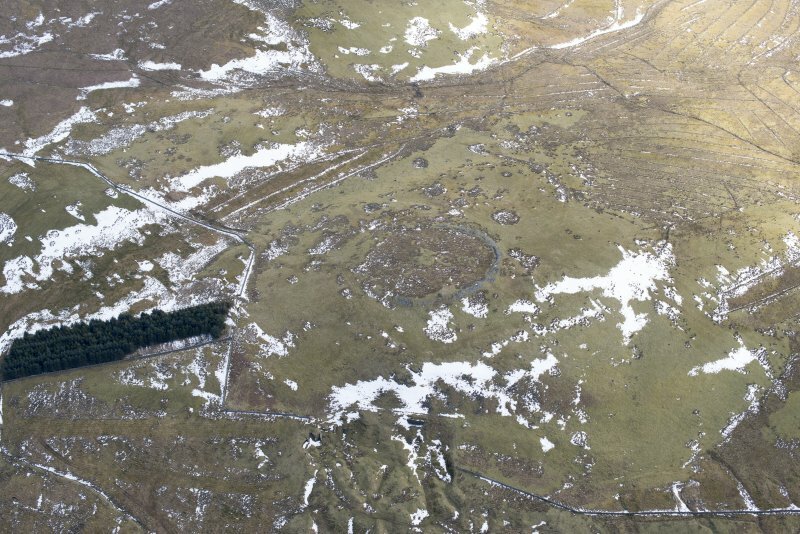 The tumbled walling is spread to a maximum width of 8.0m in the S, but is largely robbed and grassed-over around the N and E. The only trace of facing material is a 4.0m length of grounder blocks in the SE, and of several breaks around the circuit, a 4.0m wide depression on the W side is the probable entrance. 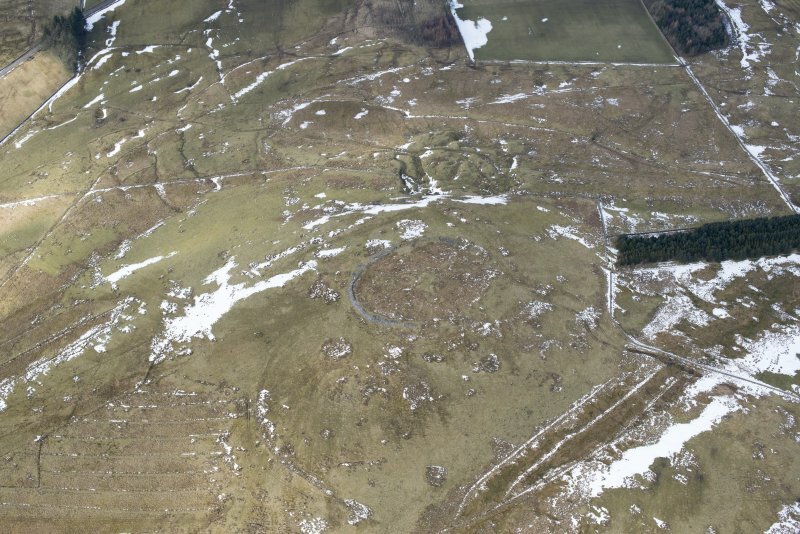 In the interior are six hut circles from 8.0m to 11.0m in diameter over walling up to 2.5m wide. Only a vague stone spread of a probable seventh survives. 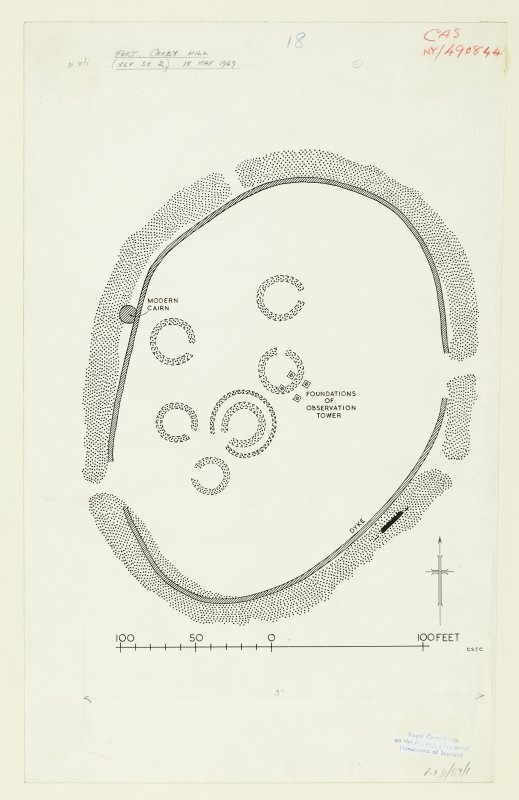 One hut (A on plan) has a shallow ditch around its S side and the remains of a stone bank (? double wall) round its N side. Other amorphous scoops and stone spreads may be contemporary but are unclear. 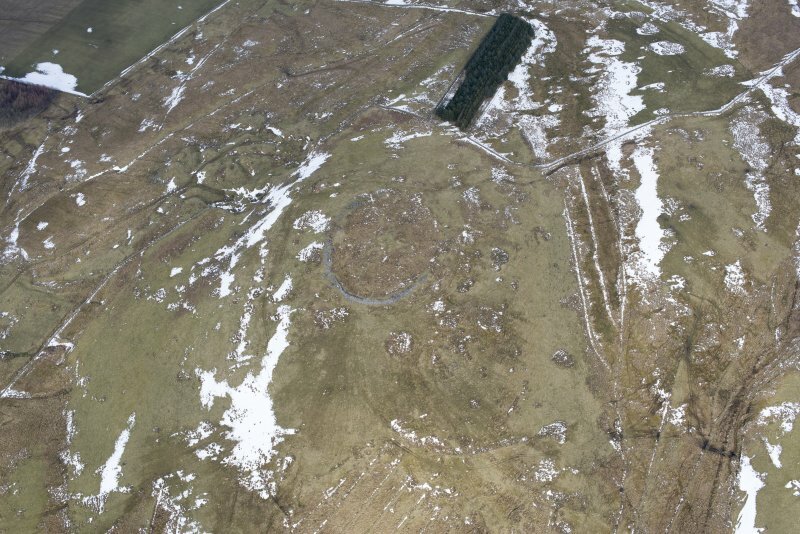 The prominent situation with steep slopes all round, except on the SE, together with the strength of the wall and possible timber house platforms, indicate that this was possibly a fort superseded by a later settlement. This fort is situated on the summit of Carby Hill and its wall was heavily robbed of stones in the 1820s. 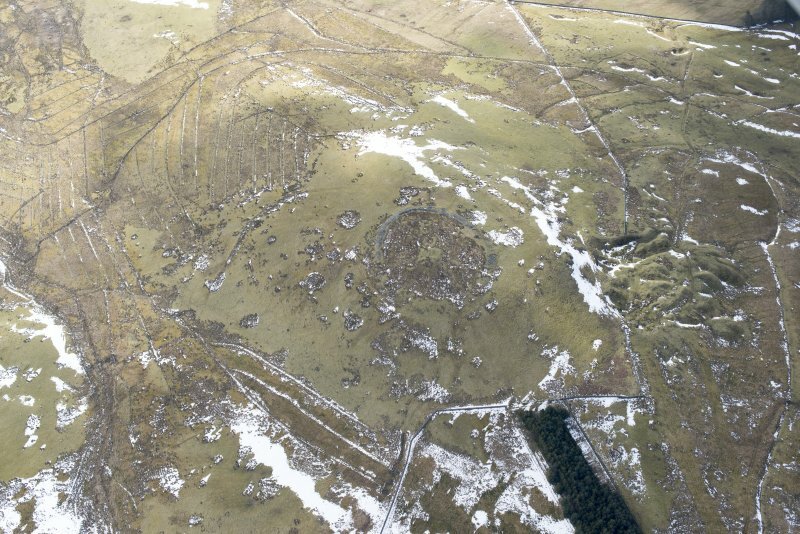 Nevertheless, it is oval on plan and measures about 86m from NNE to SSW by 68m transversely (0.48ha) within a band of rubble spread up to 8m in thickness on the S. The wall probably measured in the order of 3m in thickness, though the only evidence of either face is a short run of the outer on the SE; a later field wall extending around its inner margin may mask the line of the inner face. Four gaps in the line of the wall have been noted, one on the SW, another on the NNW and two on the E; that on the SW has the appearance of being original and the status of the others is uncertain. 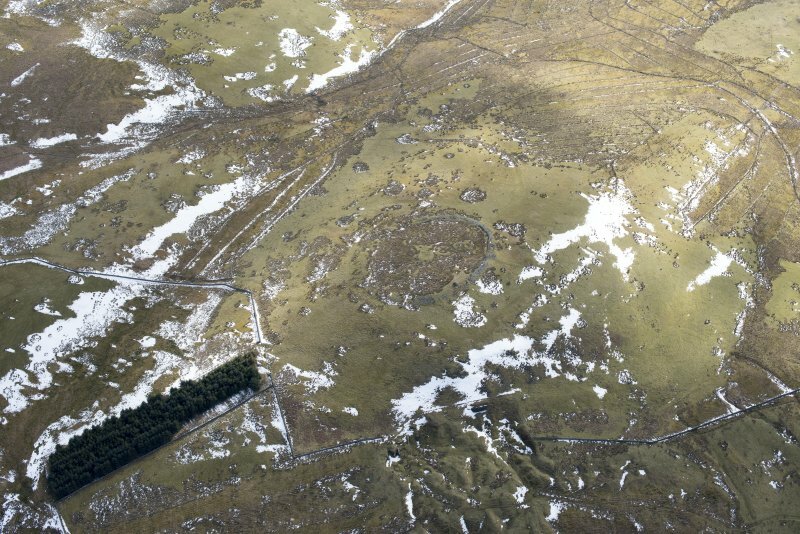 Within the interior the stone footings of at least six round-houses can be seen; they measure in the order of 7m in internal diameter and one appears to have a concentric bank around it. There may be a watch tower, built for forestry purposes in this area.